Undercover armed air marshals could be on British flights to and from America from Monday. The government says this is a "responsible and prudent" response to the heightened terror alert in the US. Transport Secretary Alistair Darling said it would reassure passengers, but that tough talks had been necessary with reluctant airlines. The pilots' union says staff might refuse to fly, fearing the guns might get into the wrong hands. Mr Darling stressed the best control was to prevent potential hijackers boarding planes in the first place. But he told BBC Radio 4's Today programme: "It is someone who's there when obviously people have got on to the plane and are intent on trying to take over that plane. It is the last line of defence." 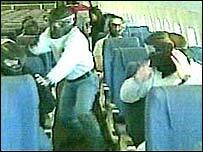 The government refused to comment on whether air marshals had already been used on British flights. British Airline Pilots Association general secretary Jim McAuslan said the union would be recommending that pilots stop flying unless certain conditions were met on the use of marshals. "For a start we don't believe that guns and air travel mix," he said. He said pilots would need to be informed if a marshal was going to be on board their plane. "The commander needs to retain authority over the whole of the aircraft." However, the government has said they will be disguised as regular passengers. When questioned on the Today programme, Mr Darling said the aircraft's captain would know if an air marshal was on the plane. Do guns and planes mix? The marshals would be used on a small number of transatlantic flights where it was deemed right for the situation, BBC correspondent Margaret Gilmore said. 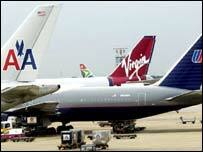 Transatlantic carriers British Airways and Virgin Atlantic have declined to comment. The announcement follows a number of security scares involving airports in recent days. Last Wednesday and Thursday six Air France flights between Paris and Los Angeles were cancelled amid fears of a terror attack. US intelligence had suggested al-Qaeda members posing a "credible threat" were due to board. And hours later, the Delta Airlines terminal at New York's LaGuardia Airport was evacuated in a scare. A joint statement issued by Home Secretary David Blunkett and Mr Darling said it was still safe for the public to fly and that the increase in security levels in the US in recent days meant the UK should propose a "proportionate and appropriate level of response". Mr Blunkett said the police and security services were already operating at the highest levels. "I can assure the travelling public that if we believed it was not safe for them to travel or fly we would say so. What we are proposing are some sensible additional security measures." Mr Darling announced back in February that armed undercover police had been trained for use on UK passenger flights. At the time airlines raised concerns about the prospect of guns being carried on board planes. Conservative shadow transport secretary Theresa May welcomed the move but suggested pilots should have been better consulted. "Most passengers want the extra comfort of knowing that the pilots are entirely comfortable with it," she told BBC News 24. Liberal Democrat home affairs spokesman Mark Oaten said everything had to be done to ensure passengers' safety. "But the home secretary must make it clear if this is a reaction to new evidence, or a delayed response to previous intelligence," he said. Sunday's announcement follows similar moves by the Australian Government to use armed guards on many flights between Australia and Singapore. Air marshals have been used in America since before the 11 September terror attacks on New York when there were just 33 sky marshals, flying mainly on international flights. Captain Dennis Breslin, an American Airlines pilot, said he would not fly without their protection. "Because between the door of the cockpit and the cabin, if the door is breached and those pilots are taken out as they were on 9/11, you're all doomed," he told the BBC. "The air marshals may carry low velocity ammunition"